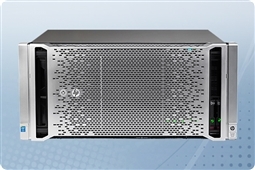 The HP ProLiant ML350 Gen9 rackmount server delivers enterprise class performance, expandability, manageability, reliability and serviceability making it a perfect choice for expanding SMB's, remote offices, and data centers. Significant performance and energy efficiency gains over previous generations and superior flexible in-server storage options make the ML350 Gen9 a perfect option for businesses looking for a system that can adapt to accommodate your increasing computing demands. Aventis Systems offers the ML350 Gen9 in two different chassis options: the 8-bay 2.5" hard drive model with optional upgrades to 48 total drive bays, and the 8-bay 3.5" hard drive model with optional upgrades to 24 total drive bays. Please browse our ML350 Gen9's below and click to customize! Maximum Internal Storage: 16TB standard, 96TB with addition of 12Gb SAS Expander and hard drive cages.